Dialogues Between Neuroscience and Society Panel on Music and the Brain. Pictured from left to right: Charles Limb, Pat Metheny and Richard Huganir. 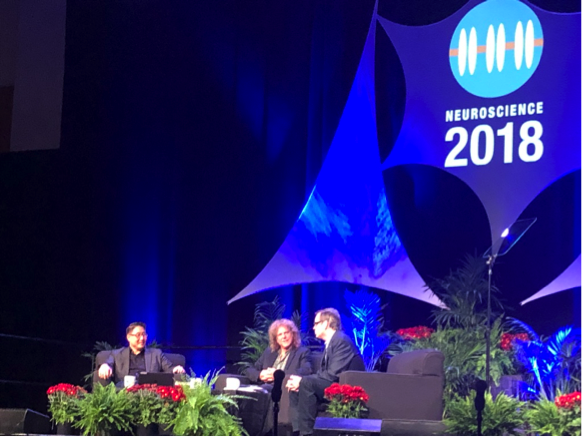 The 2018 Society for Neuroscience Annual Meeting in San Diego, CA started on a spectacular note this November, featuring the legendary jazz guitarist Pat Metheny in the public lecture Dialogues Between Neuroscience and Society: Music and the Brain. Addressing an overflowing hall of nearly five thousand researchers, clinicians, advocates and fans, the 20-time Grammy Award winner Metheny was joined by Charles Limb, MD, Francis A. Sooy Professor of Otolaryngology – Head and Neck Surgery at University of California San Francisco, and Richard Huganir, Society for Neuroscience President and Bloomberg Distinguished Professor and Director of the Solomon H. Snyder Department of Neuroscience at Johns Hopkins University. “This is a unique gig for me. I don’t usually get to just talk, usually I have to warm up for two hours before getting onstage,” joked Metheny. The conversation covered a variety of topics on the effects of music on the brain, ranging from the process of creativity in music, the neural signature of jazz improvisation in the brain, aging and music, and music as medicine. A common theme of the lecture centered on music being a universal language and powerful force in our world that bridges the understanding of different cultures and ways of life. Metheny and Huganir described music reflecting the best hopes, dreams, and memories of life. Metheny also discussed jazz being a process or way of living rather than a journey, and that we are improvising all the time in our lives in various roles and scenarios. The conversation then shifted to aging and music. Metheny was asked whether he felt aging had an effect on his artistic creativity. His sense (he is 64) was that he plays much better now than when he was younger. “I have way more ideas than I have time to execute them.” Metheny noted that there are 30-year old musicians he has worked with that can barely hang through a tour as compared to aging musicians. He also provided an example of another brilliant aging musician, Roy Haynes (age 93), the father of modern jazz drumming, who is still performing at venues such as the famous Blue Note in New York City. Recent preliminary studies presented at the Society for Neuroscience, support the notion that aging musicians may have an advantage in the realm of inhibitory control and protection from cognitive decline. The final topic of discussion revolved around the idea of music being able to provide healing (i.e., music as medicine). The National Institutes of Health have recognized that music can have an impact on healing. Huganir and Metheny both discussed how music can heal the local, national, and global community. Huganir provided a touching example of how Metheny’s music help him with the grieving process after the death of his father. Metheny discussed his piece “Is This America” that was released after Hurricane Katrina, and how that helped him and the music community process the devastation left behind from the natural disaster. A resounding question from the panel and the audience is where does music and brain research go from here? Metheny mentioned that “soul” is the X factor, what makes music, music, but is it possible to quantify something like this? “You can’t see, touch, smell or taste music, but when you walk into a club or a concert hall where the performers are really on, regardless of the style or genre that they are playing in, there is no mistaking it,” said Metheny. Limb and Huganir mentioned that further development of neuroimaging technology in the next 20 years could potentially provide a breakthrough in music and brain research. Written and reported by IAM Lab Contributor Patricia Izbicki. Patrici Izbicki is a classical pianist and PhD candidate at Iowa State University studying the effects of music training on cognitive and motor inhibition across the lifespan.